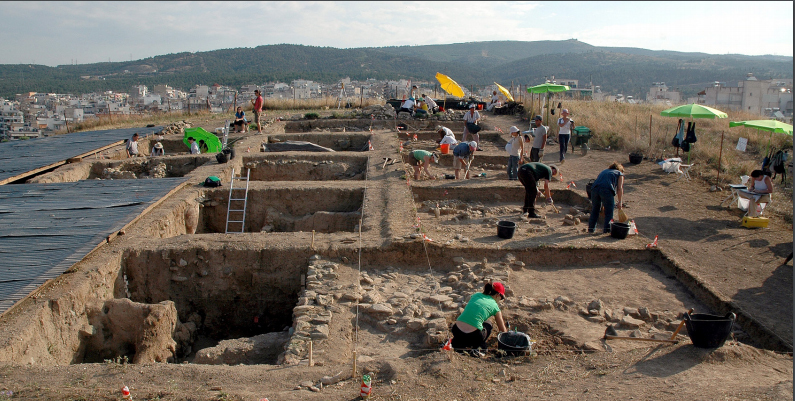 The fieldwork will take place at the Bronze and Iron Age settlement site of Thessaloniki Toumba. The Summer School of Archaeology in Thessaloniki is an innovative program offered by the Toumba Excavation of the Department of Archaeology and the School of Modern Greek Language of the Aristotle University. During the first week, an intensive Greek language course will be provided at the School of Modern Greek. The SMG is an academic unit with dynamic development. Its basic aim is to promote the Greek language and culture through a combination of educational, research, as well as cultural activities. The school’s mission is not solely to support the teaching of Greek as a second/foreign language, but also to provide learners with rich language and cultural experiences. During this week, participants will have the opportunity to acquire some basic vocabulary and useful expressions in Modern Greek. They will also have the opportunity to get acquainted with the contemporary Greek culture and way of life. Classes will combine the teaching of the language with the immersion in the Greek culture; to this aim, thematic and cultural workshops will be organized and provided in order to give participants a taste of the contemporary life in Greece. The teaching staff of the SMG are highly qualified and have long experience both in teaching and in material design for learners of Greek at all levels, as well as for learners with specific language needs. So the classes provided will be tailor-made and aim to enable the participants of the summer school to acquire survival Greek for basic communicative purposes and related to their own individual needs. The fieldwork will take place at the Bronze and Iron Age settlement site of Thessaloniki Toumba, excavated by the Department of Archaeology, one of the top Archaeology Schools in Europe. * Work will focus on the investigation of the well preserved prehistoric houses of the site and the understanding of the various aspects of the lives of their inhabitants. During the two weeks at the excavation the participants will be introduced to frontline fieldwork methods and archaeological theory. Students will rotate between digging in trenches and the processing of finds in the excavation shed and laboratory in order to acquire practical archaeological skills in a real research environment. Working in the trench will involve training, in the textual and three-dimensional documentation of the excavation process and the understanding of the basic principles of archaeological stratigraphy. In the shed, students will work on the quantification, classification and cataloguing of atrtifacts and the processing of bioarchaeological remains. Fieldwork will be supplemented in the afternoon by hands on workshops on interdisciplinary approaches related to the study of excavated finds. Furthermore, through a series of lectures by specialists and fieldtrips, participants will familiarize themselves with aspects of the history and art of Northern Greece throughout the past.